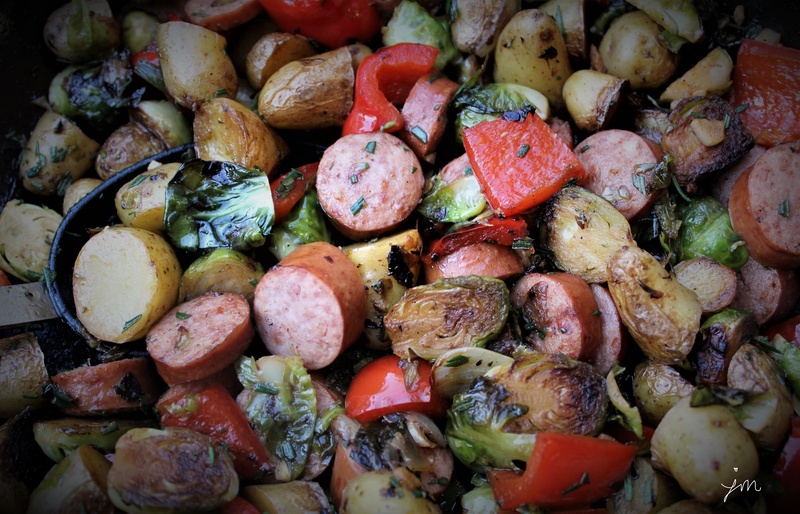 Turkey Kielbasa, Brussels Sprouts, and Potato Skillet. We all find ourselves on those days when we just need to throw something together quick for dinner – right? We want it to be easy, but healthy and delicious if possible. The other day I threw this together and really enjoyed it. 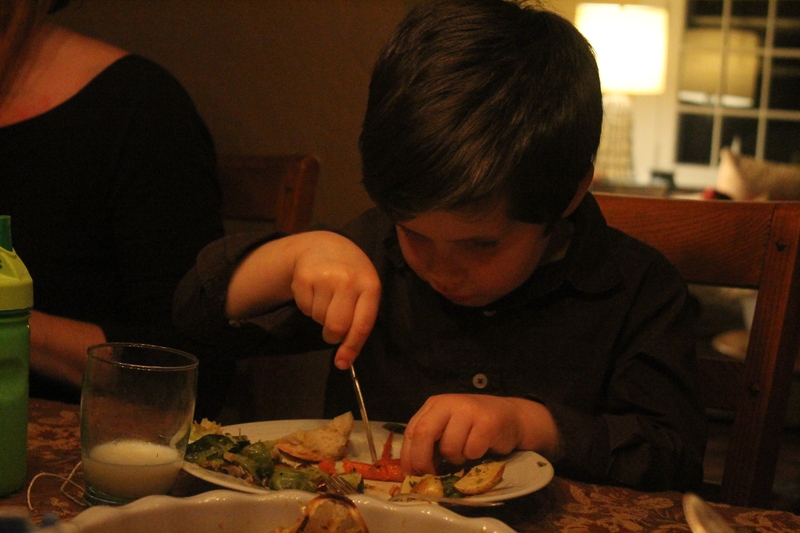 We had it with a cucumber salad on the side for a healthy delicious meal in 30 minutes. I’m sure there are many options for different proteins and veggies and spices, but here is how I made this one. Do you ever throw together quick “skillet” meals like this? What do you like to use? Heat 2 Tbsp olive oil in a large skillet. 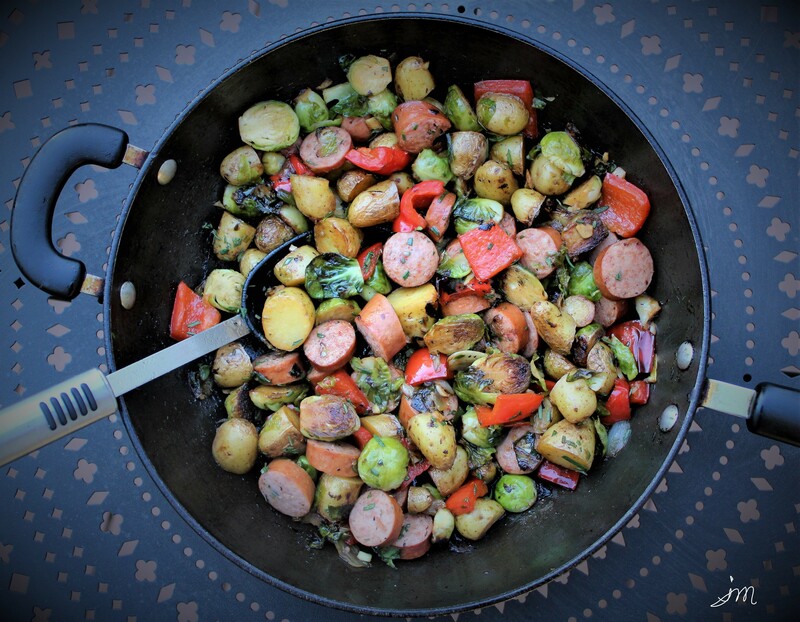 Add Brussels sprouts, potatoes, red bell pepper, onion, and salt and pepper to taste. Cook for approximately 20 minutes or so beginning with high heat to brown and then reducing to medium and covering with a lid until Brussels are becoming tender and potatoes are almost cooked through (you can test with a fork). Stir occasionally. Add additional Tbsp of olive oil, garlic, turkey kielbasa and fresh rosemary. Cook approximately 10 more minutes on medium heat, stirring occasionally until all is cooked and flavors are blended well. Stores well to reheat for leftovers. 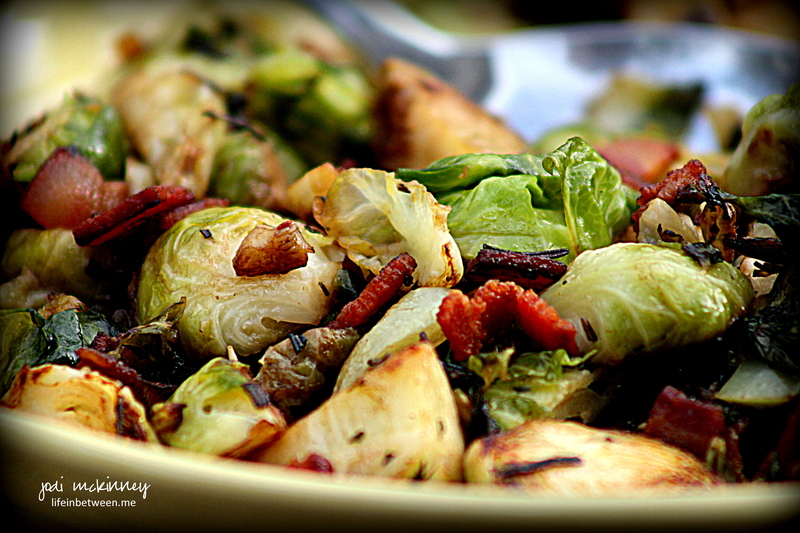 Roasted Brussels Sprouts with Bacon and Apples. 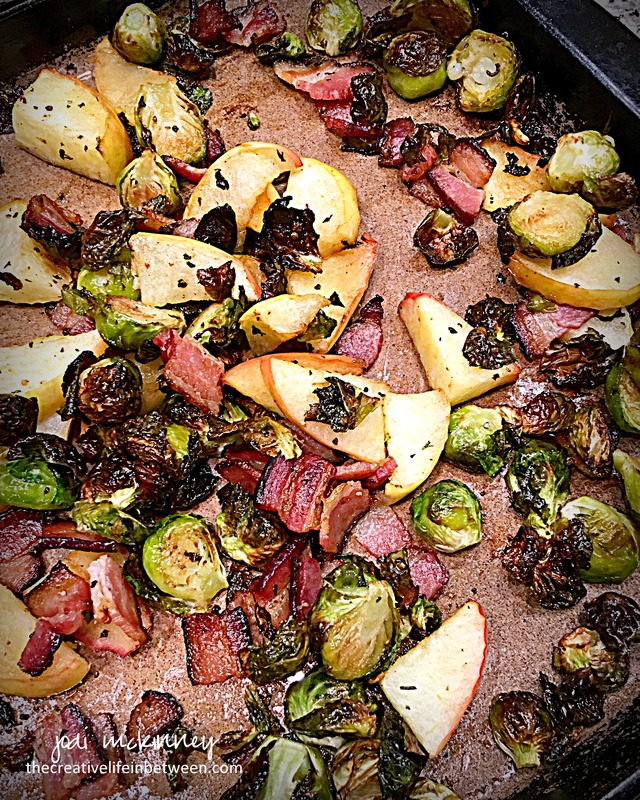 When my friend, Janet shared a recipe yesterday on Facebook for Roasted Brussels Sprouts with Bacon and Apples by Mary from BarefeetintheKitchen, I knew I was making this for dinner last night. 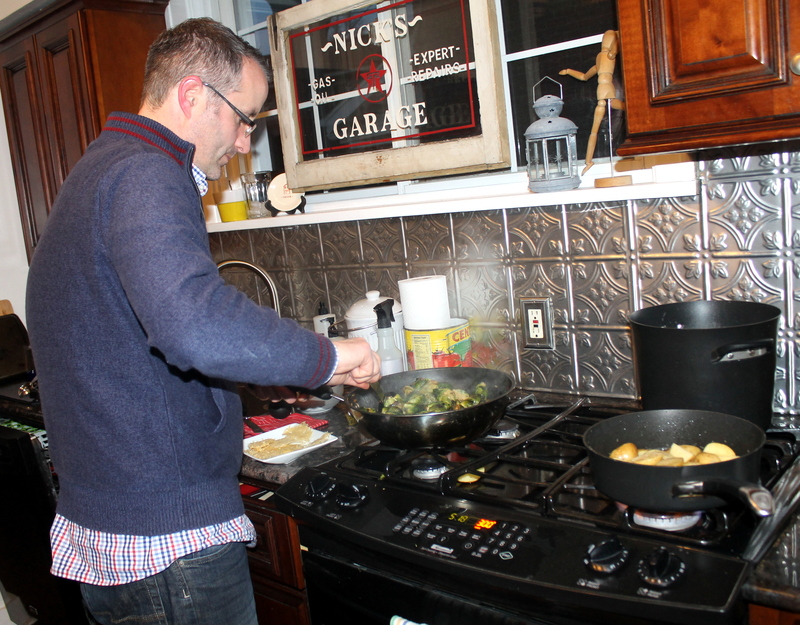 I had just bought some fresh tiny, tender brussels sprouts, and I had bacon in the freezer and apples in the crisper. And oh am I glad I tried this! It was absolutely amazing! A veggie side dish easy enough for an every night dinner as well as being delicious and “special” enough to serve to guests for a special occasion is perfection in my book! Here is how I made it! 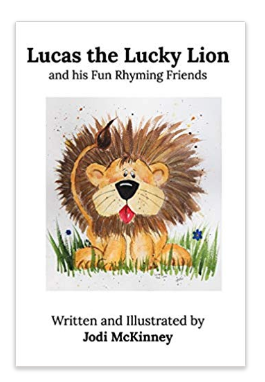 Please let me know if you try and how you like it. Place bacon in a single layer on stoneware baking pan or shallow baking sheet. Roast 10 minutes. Remove bacon from pan and set aside. 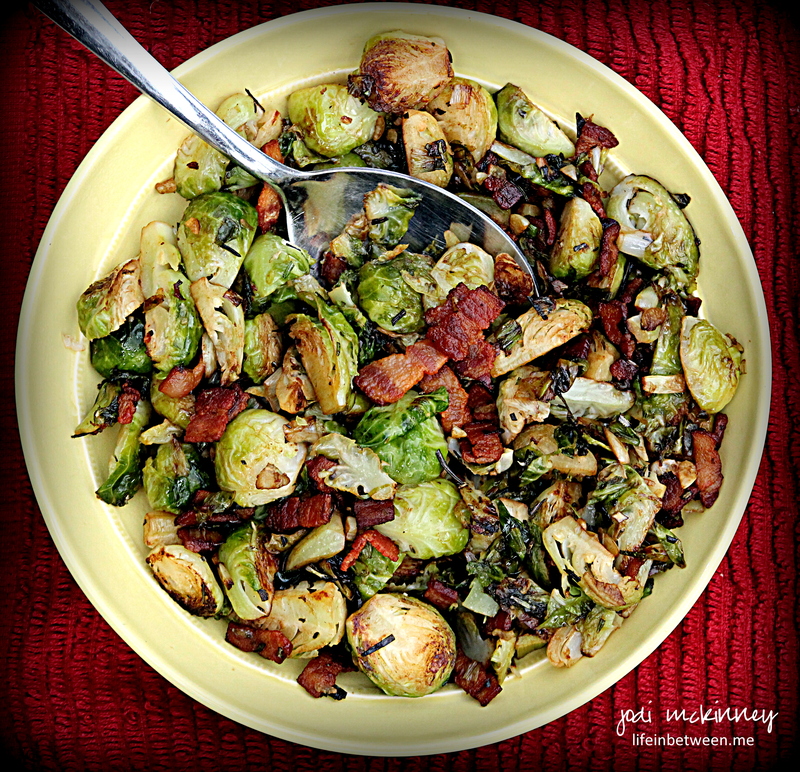 Place Brussels sprouts in pan and toss thoroughly in bacon drippings. Sprinkle generously with salt and pepper. Roast for 10 minutes. 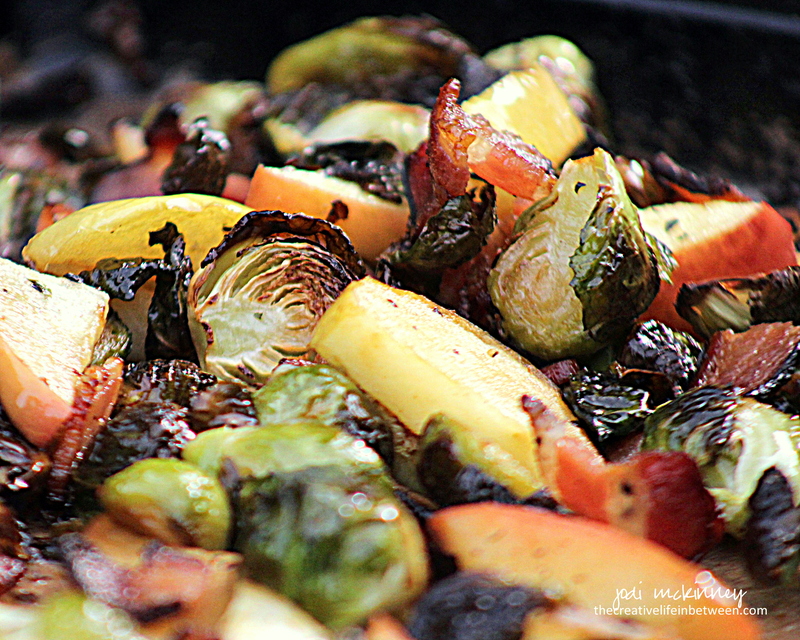 Remove pan from oven, and add apple pieces and bacon to Brussels sprouts in pan. Toss to incorporate. 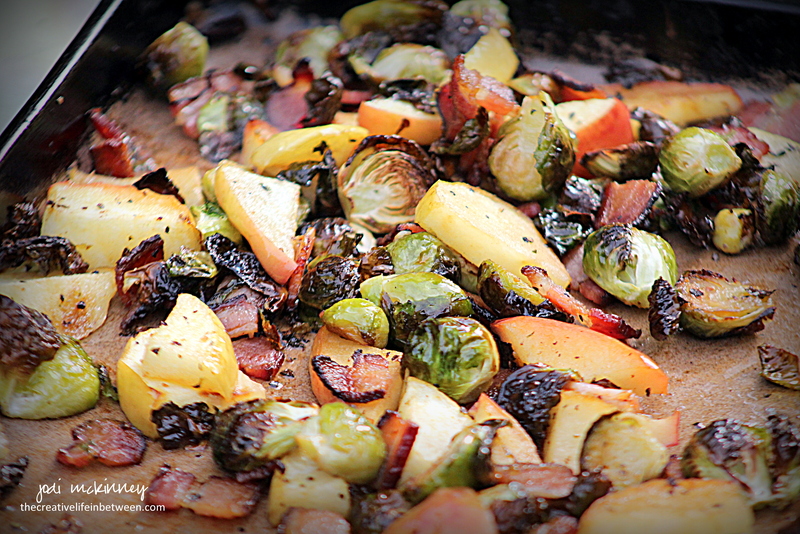 Roast an additional 10 minutes or until Brussels are browned and apples become tender. Remove from oven, and sprinkle red wine vinegar on top of all. Toss, and serve immediately. 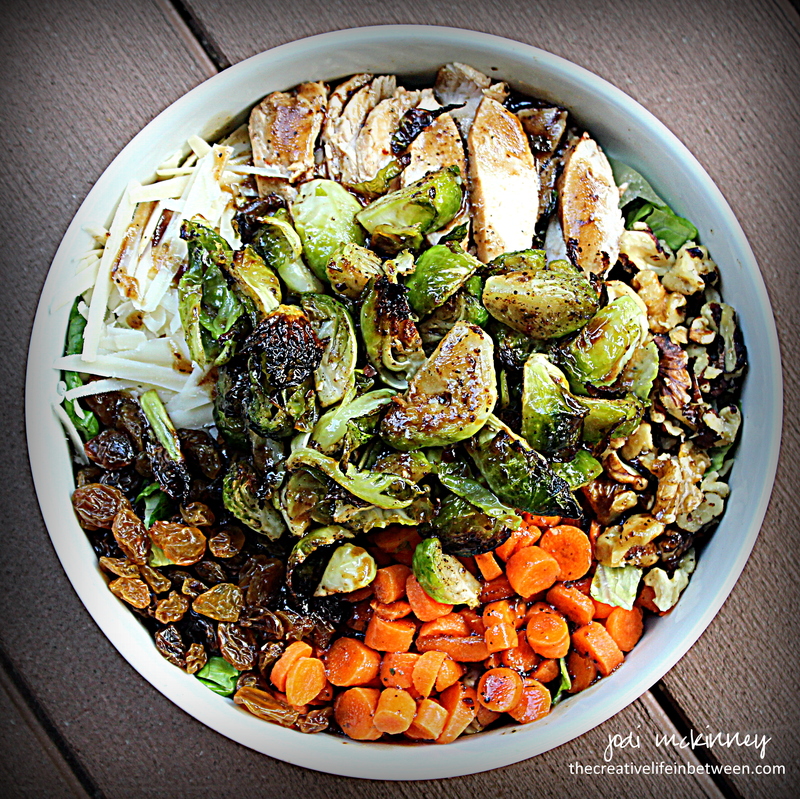 Roasted Brussels Sprouts & Chicken Salad. On warm Summer days, salads are so great for dinner! And there are so many fresh ingredients available to mix and match. 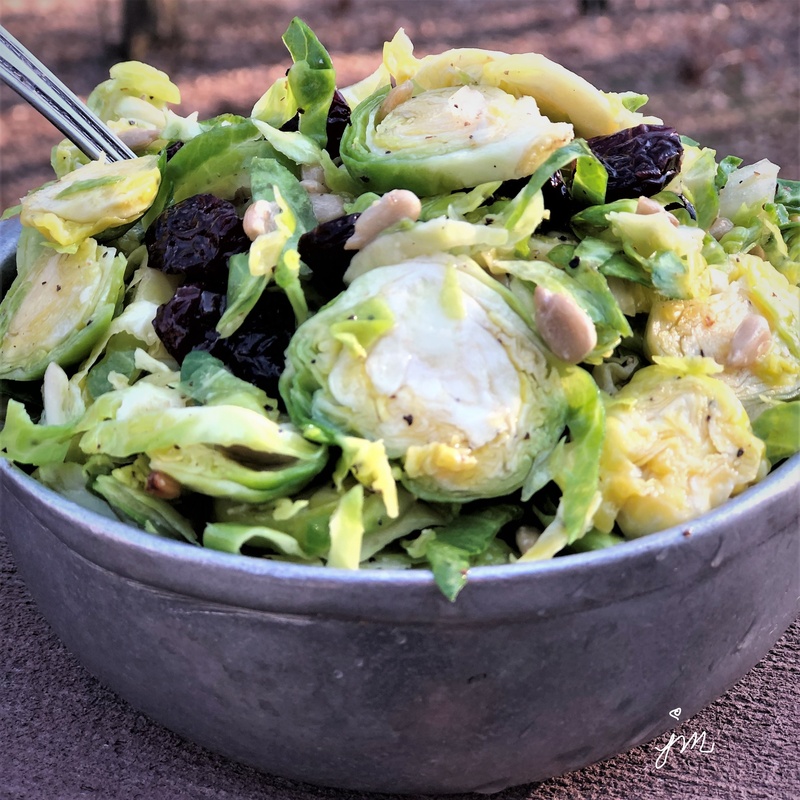 I had some fresh Brussels Sprouts and thought they might work great in a dinner salad. They are so delicious roasted simply with olive oil, garlic powder, salt and pepper. 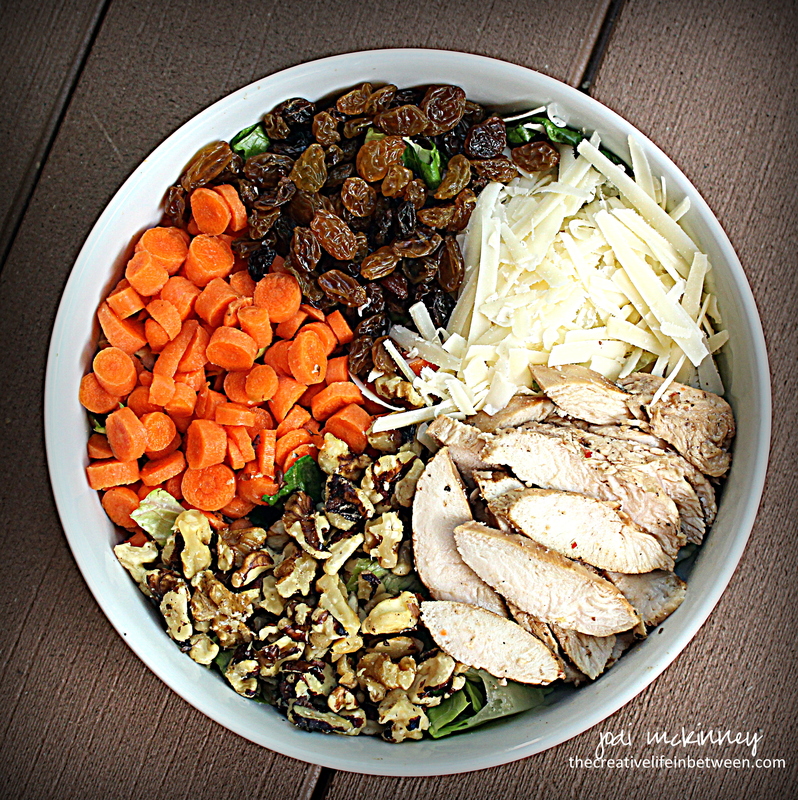 Then all you have to do is add your favorite greens to a bowl and top with some yummy, healthy additions of fruit and nuts and cheese and protein and more veggies. 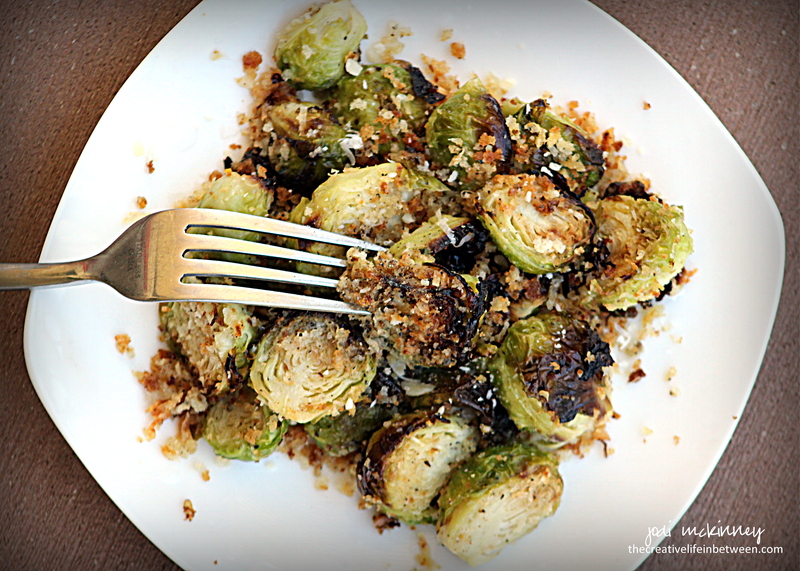 The grand finale topping is the roasted Brussels sprouts and a drizzle of balsamic vinaigrette. It is a full meal deal covering all the bases! Here’s the recipe for the way I made it, but feel free to mix and match and tweak it up to how you like. 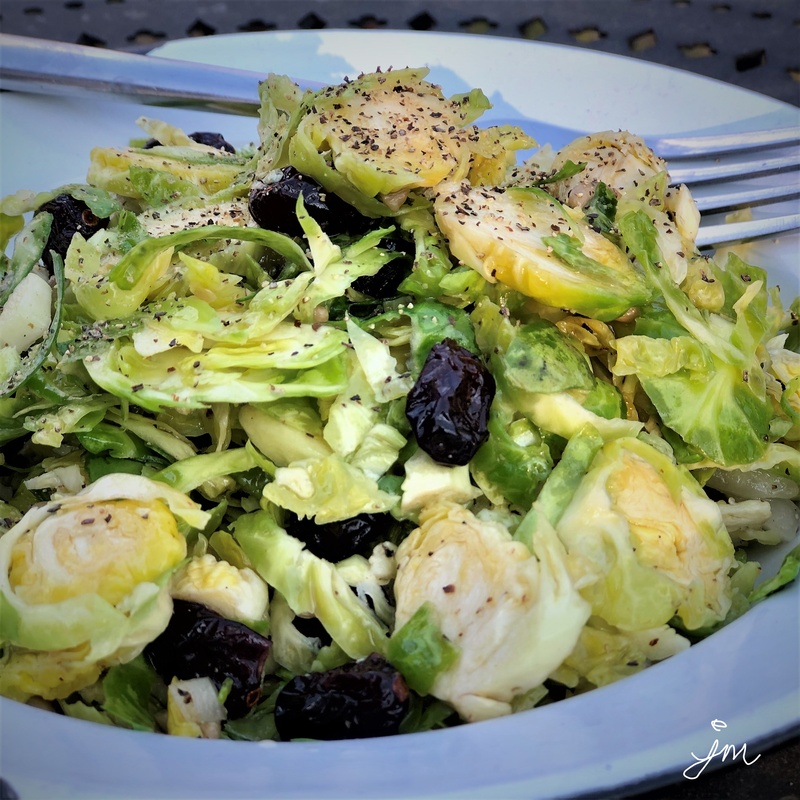 Roasted Brussels sprouts are a great addition to any salad! Cut stems off Brussels sprouts, then cut into quarters. 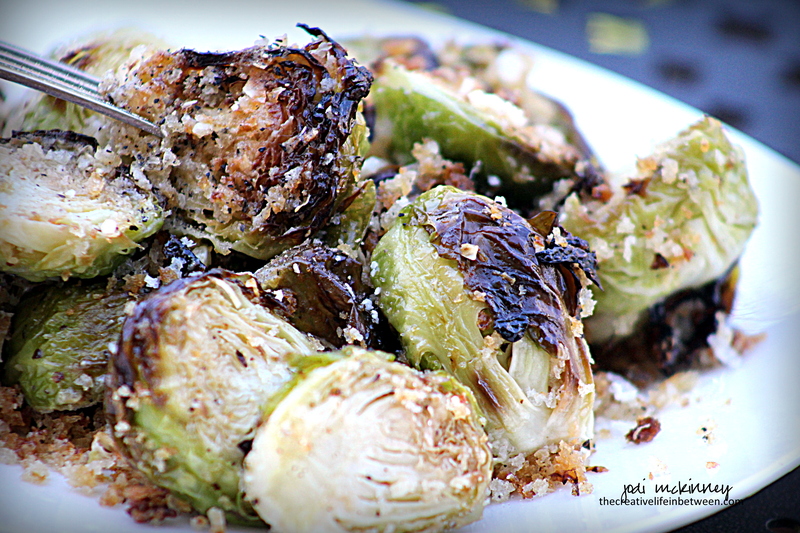 In mixing bowl, combine Brussels sprouts, olive oil, garlic powder, salt, and pepper. Pour into baking pan and roast approximately 25 minutes, stirring occasionally. Pour dressing on top, then mix. 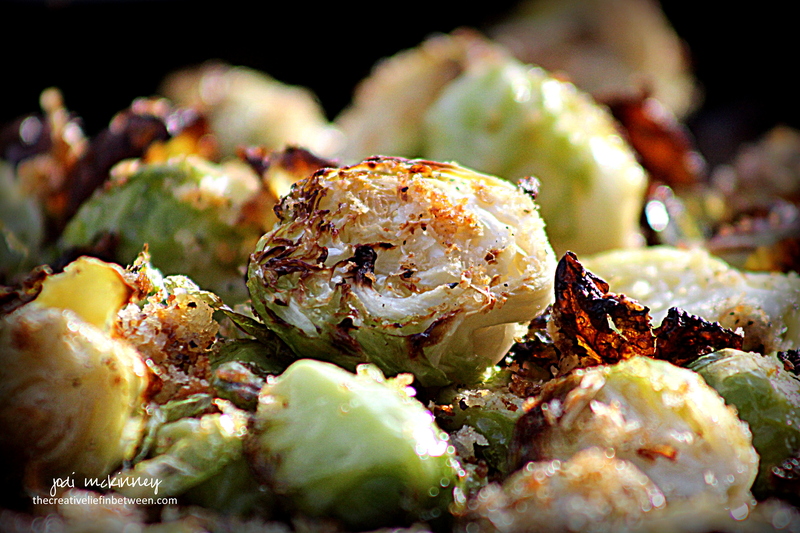 My Favorite Roasted Brussels Sprouts. After all the cookie recipe posts of late, I thought I would share an amazing vegetable recipe I recently tried and LOVED! I recalled seeing one of those hyperlapse videos someone shared on Facebook that looked so yummy, so I wrangled these up last Sunday for Hubby and me. We loved them. Throw all the ingredients in a Ziploc bag to toss together early in the day or right before serving. Spread them on a baking stone or sheet and roast to yummy goodness! 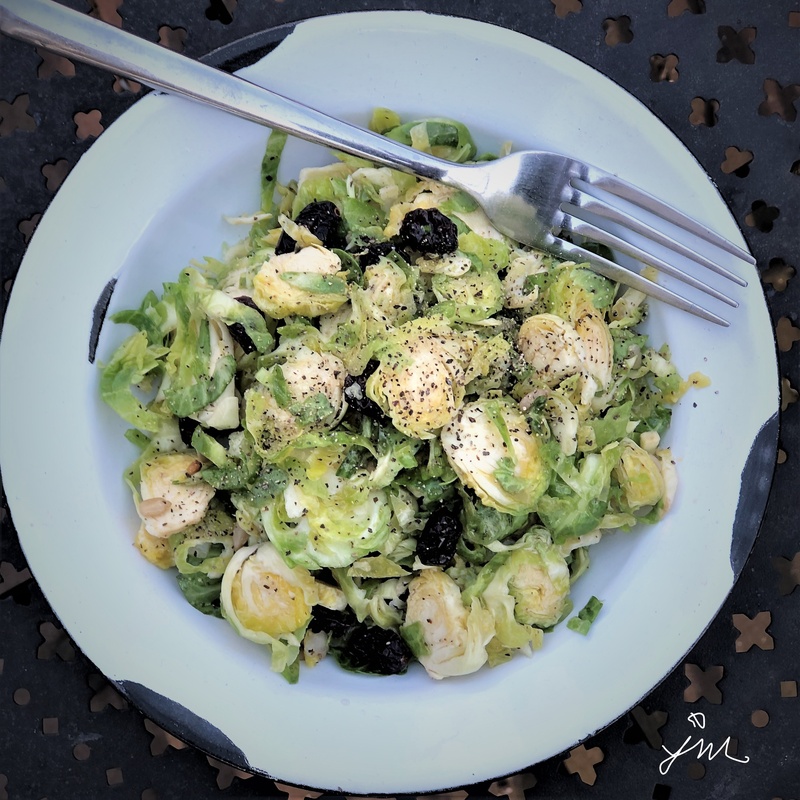 If you are a brussels sprouts lover, I think you are really going to enjoy this simple, delicious recipe. Cut tough bottoms off brussels sprouts, and then slice in half. Throw in a gallon Ziploc bag. Drizzle with olive oil. Sprinkle in garlic salt and pepper. Add Panko crumbs and Parmesan cheese. Shake and massage bag to full incorporate and coat all brussels sprouts. Pour contents of bag onto baking stone or shallow baking sheet. Roast approximately 20 minutes until browned and tender, stirring once or twice during roasting. 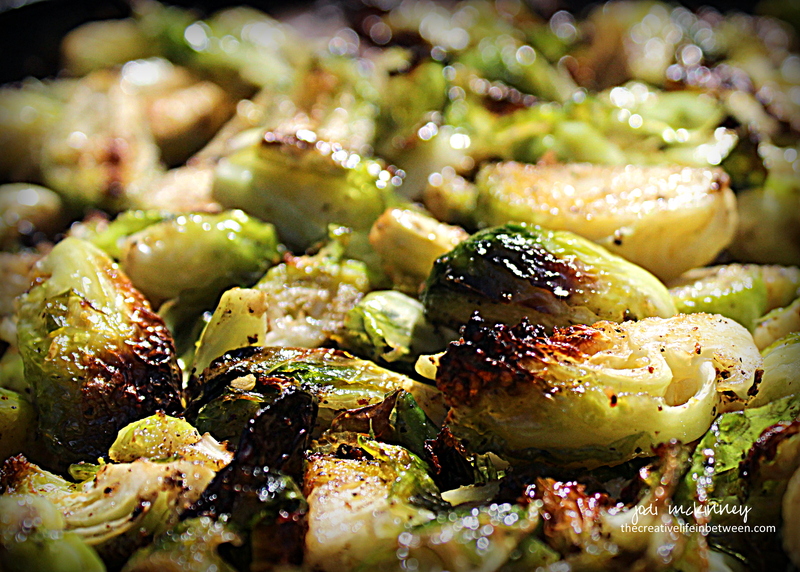 Fresh Brussels Sprouts are so divine – especially when sauteed with bacon and onions and garlic and rosemary and splashed with balsamic vinegar. 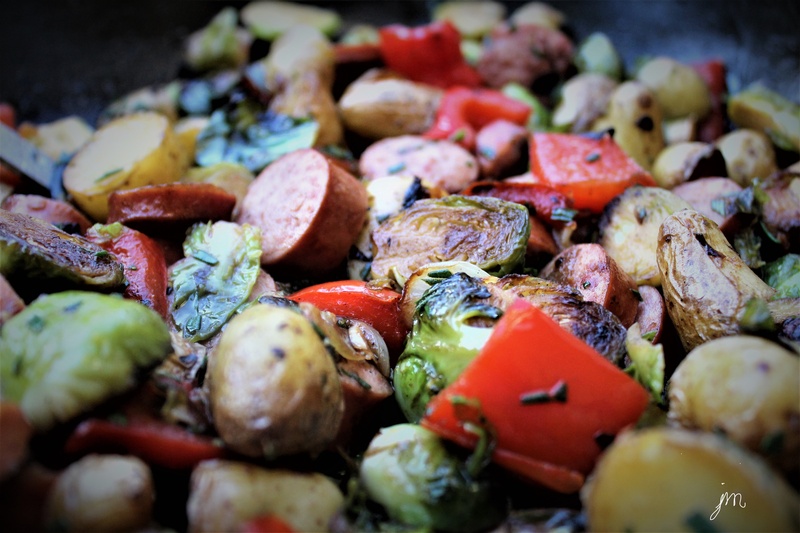 If you are looking for a knock-out vegetable dish for a special occasion or a simple veggie side dish for Sunday supper or a weekday dinner, this recipe rocks it all around. It takes a teensy bit more time than throwing a bag of frozen corn in a pot, but it is OH SO WORTH it! 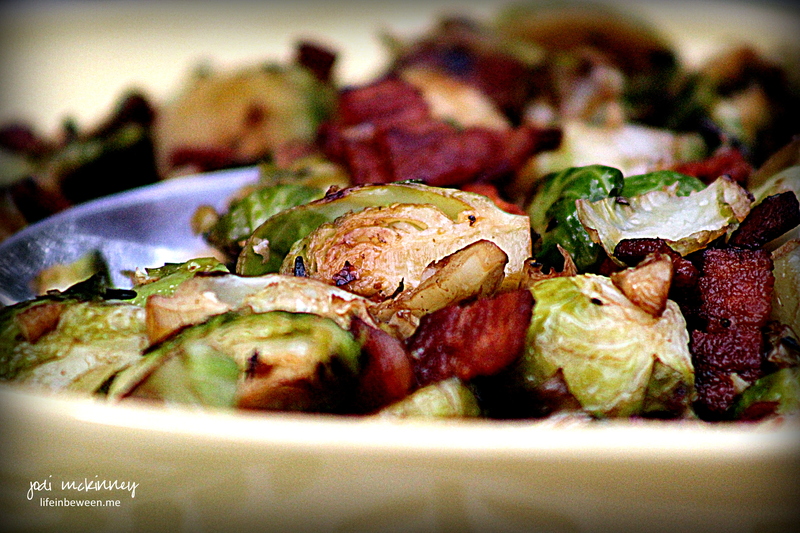 I don’t know about you, but I can’t think of anything Brussels sprouts can’t go with! 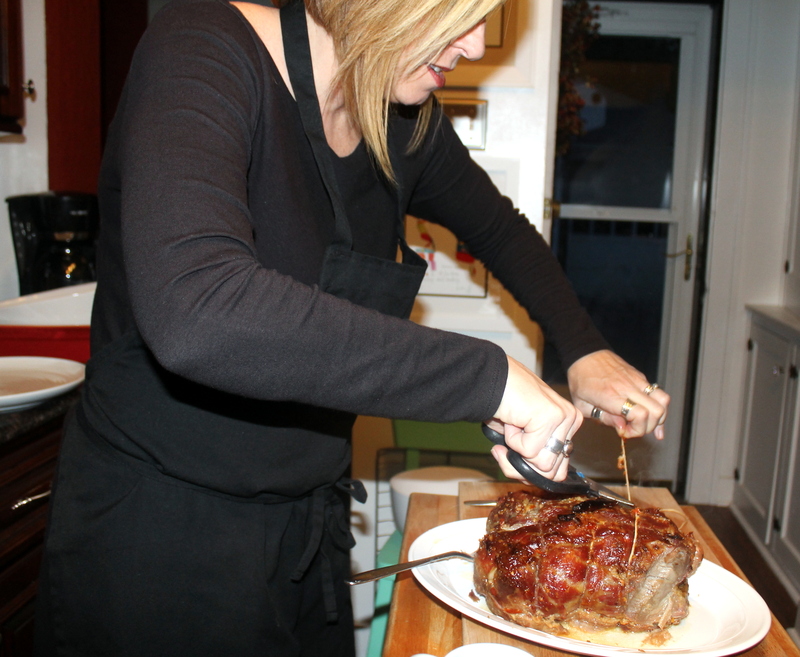 Hope you get a chance to try and enjoy this recipe. Meanwhile, cook bacon in a large heavy skillet over medium heat, stirring, until just crisp, 5-6 minutes. 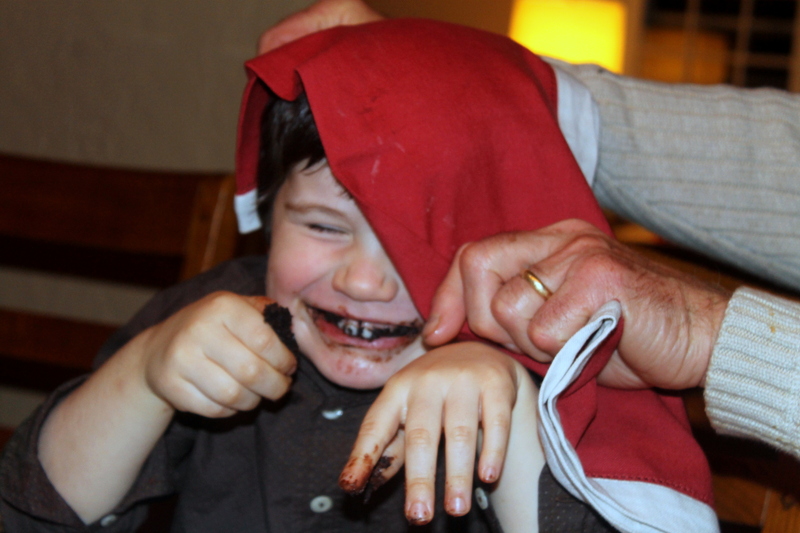 Remove with a slotted spoon to drain on a paper towel. Pour out all but about 1 tablespoon bacon fat from the pan. Add olive oil to the pan. Add green onion and garlic and cook, stirring often, until soft but not browned, about 4 minutes. Stir in rosemary, salt and pepper. 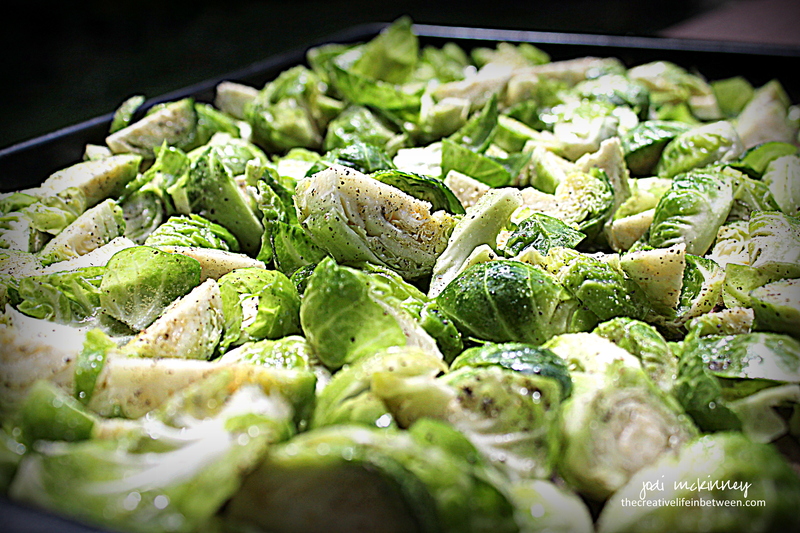 Increase heat to medium-high, add the Brussels sprouts, and cook, tossing or stirring occasionally, until tender and warmed through and beginning to brown, about 3-5 minutes. Add the bacon and balsamic vinegar. Stir an additional minute. Pour into serving dish and enjoy! 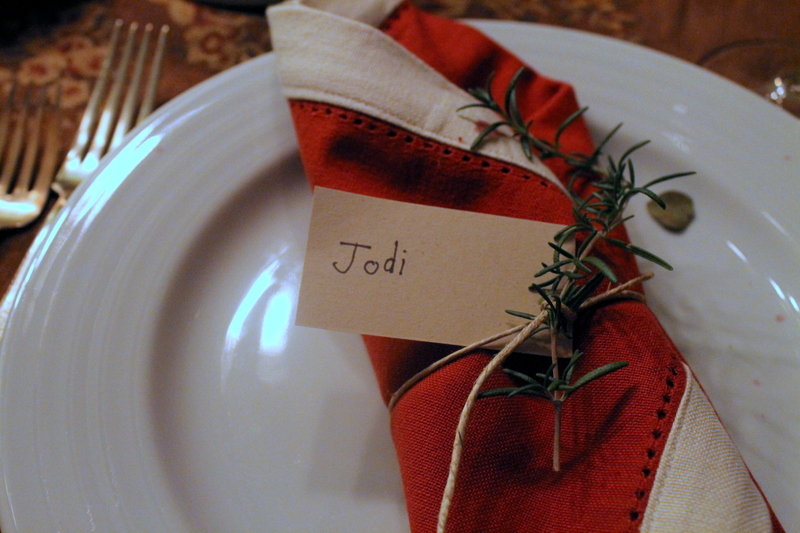 We had the pleasure of spending an unforgettable Un-Thanksgiving with some of our undeniable favorites this past Saturday. Now before you get all, “What the heck? Aren’t you thankful? 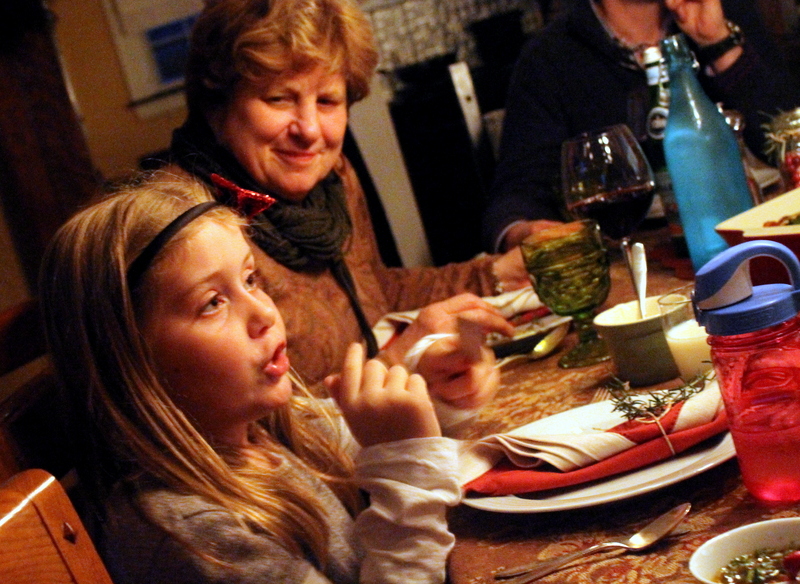 Are you anti-Thanksgiving?” on me… I LOVE Thanksgiving, and I am unbelievably thankful for so many un-deserved blessings in my life. It’s just that it is impossible to be with everyone you want to be with on that one certain day for that one certain meal at that one certain time. Right? 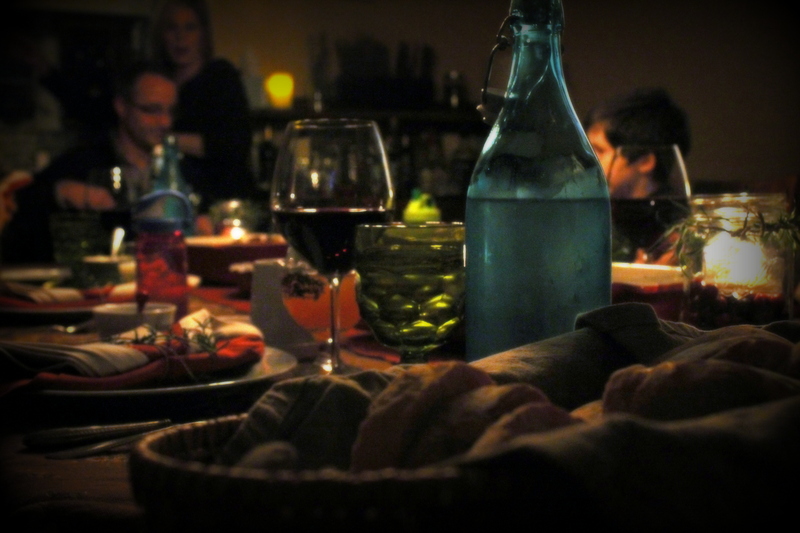 So my unparalleled cousins, Nikole and Michael, undertook the task of preparing an unforgettable Un-Thanksgiving feast and family celebration. 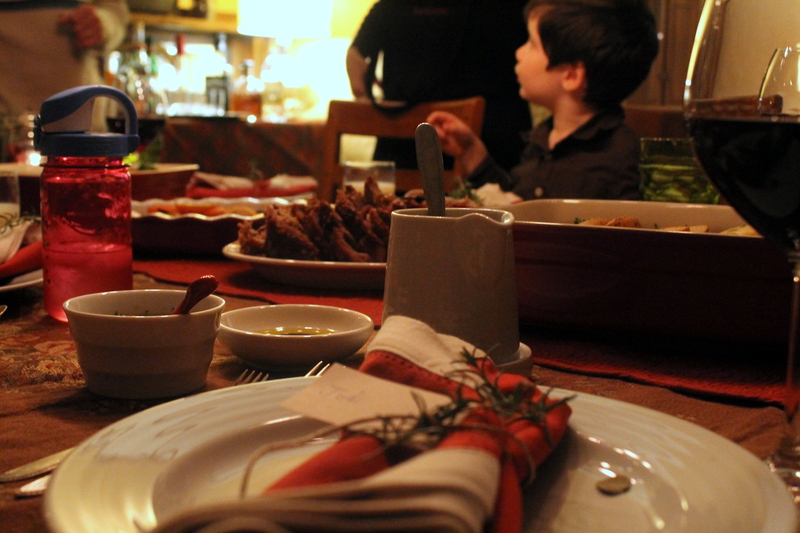 Unlike your traditional Thanksgiving meal, we had the most unequivocally sumptuous pork roast with an unbearably amazing vinaigrette, roasted potatoes, the most unfathomably incredible roasted brussels sprouts with chorizo and chopped almonds, roasted fresh carrots, and fresh baked bread with oil for dipping. We uncorked unlimited bottles of vino (apparently too many as I certainly did not have my camera focused for this timer-set group shot! 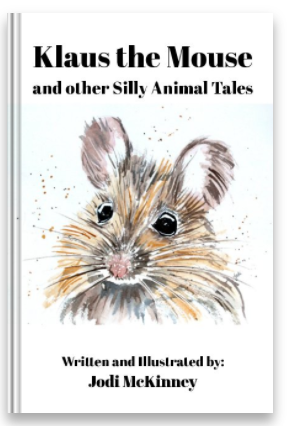 )… We laughed unstoppably…. We even unleashed our inner Broadway talents while singing and dancing to “Frozen” after unsparingly stuffing our tummys and snuggling on the couch. 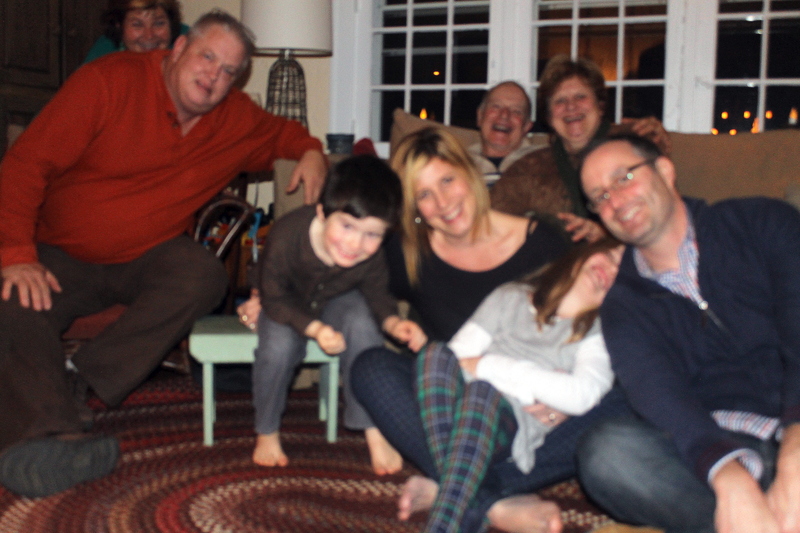 The unlimited love unraveled that day was unmistakable. So think about doing something untimely and unexpected like an Un-Thanksgiving or Un-Christmas or Un-Whatever…… You might just unravel some unexpectedly untouchable moments and memories.